Chairman of Warri South Local Government Area, Dr. Michael Tidi on Friday September 7, inaugurated Warri South Local Government Health Authority, LGHA, stressing that it is not a job for the boys, but necessitated by the desire of the state governor, Dr. Ifeanyi Okowa to ensure comprehensive implementation of the Primary Health Care Under One Roof, PHCUOR, Policy in Delta State. 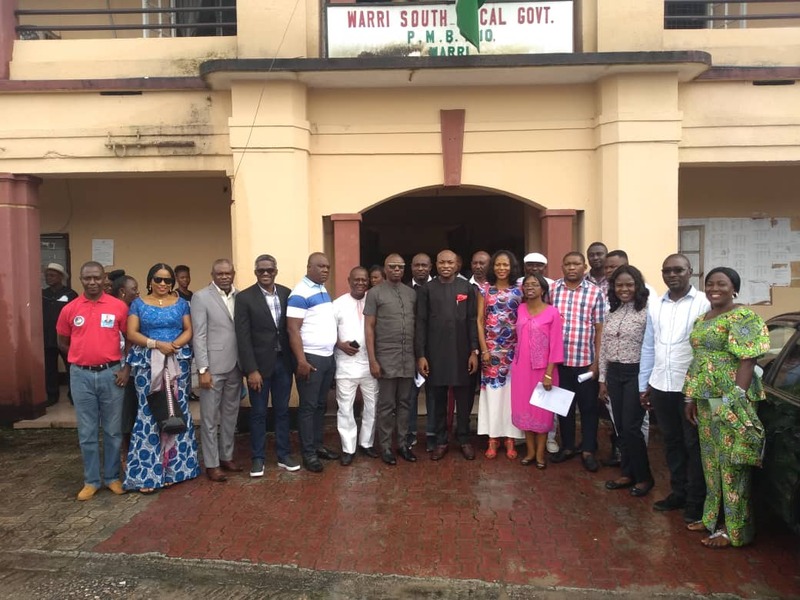 The Warri South Council Boss outlined the eight -core responsibilities of the Local Government Health Authority to include development and management of infrastructures at the local government area level for primary healthcare, assisting with the database collection, collation and dissemination, ensuring effective drug revolving fund scheme as well as provision of facilities for referrals. The seven -member Local Government Health Authority has Hon. Ete Keke as chairman, Warri South Council Supervisor for Health as member and Dr. Sagay Maureen as secretary. Director -General / CEO of Delta State Contributory Health Commission, Dr. Ben Nkechika and the Executive Director,Delta State Primary Health Care Development Agency, Dr. Winful-Orieke Jude who was represented by Dr. Paul Yinkore, underscored the importance the State Government attaches to the full implementation of its primary healthcare policy at the rural areas. Chairman of Local Government Health Authority for Warri South, Hon. Ete Keke, assured that they will work assiduously to achieve the aims and objectives of the State as well as local government in terms of effective primary healthcare delivery to the grassroots. Meanwhile, the Warri South Local Government Chairman, Dr. Tidi has advised the newly posted DPO of Police 'B' Division Warri, S P Ebi Orubiri to ensure full compliance to the recently signed Delta State anti 'deve' law in his jurisdiction. Dr. Tidi also stressed the need for the DPO to adequately engage political aspirants and their followers to play by the rules to avoid violence during the forthcoming political party primaries. Earlier, the new DPO of 'B' Division Warri, S P Ebi Orubiri assured that he will implement policing the way it ought to be with human face. Orubiri promised to separate fighting crime from dealing with community issues, just as he noted that undertaken will be signed with community leaders as part of peace building strategy.